Use a variety of bones and meat. Meat gives your stocks rich flavor, while collagen in the bones gives stocks body. We like the flavors and thickening from an assortment of center-cut beef shank pieces, beef short ribs, and pre-cut beef shank pieces. If you have difficulty finding bones, see your butcher or ask at the meat counter. If you’re having bones cut for you, request back, neck, or shank bones. These all have high collagen contents. Ask that the bones be cut into three- to four-inch pieces. Roast in a large pan. Spread the bones into a single layer for roasting. Bones resting on top of each other don’t caramelize. Turn the bones often to avoid burning. Scorched bones or anything burned onto the bottom of the roasting pan will make your stock taste burned, and that’s not the flavor you want. Don't forget to check out our primer, How to Make Homemade Stock. Then elevate the value to this Beef Stock and use it in our recipe for Steak Chili. Because this recipe has a large yield, feel free to halve it, or freeze any excess in freezer-safe containers. Thaw stock and use as needed. Roast bones in a single layer in a roasting pan until caramelized, about 11/2 hours, stirring periodically to prevent burning. Transfer bones to an 8-qt. stockpot; drain and discard excess grease from pan. Toss vegetables with tomato paste to coat; transfer to same roasting pan. Roast vegetables until caramelized, about 45 minutes; transfer to stockpot. Place roasting pan on the stove top over medium-high heat. Deglaze roasting pan with wine, scraping up browned bits from the bottom. Pour wine and browned bits over bones and vegetables in stockpot. Add parsley, thyme, bay leaves, and peppercorns to the stockpot. Add cold water to cover contents by 1 inch; bring to a simmer over medium heat. 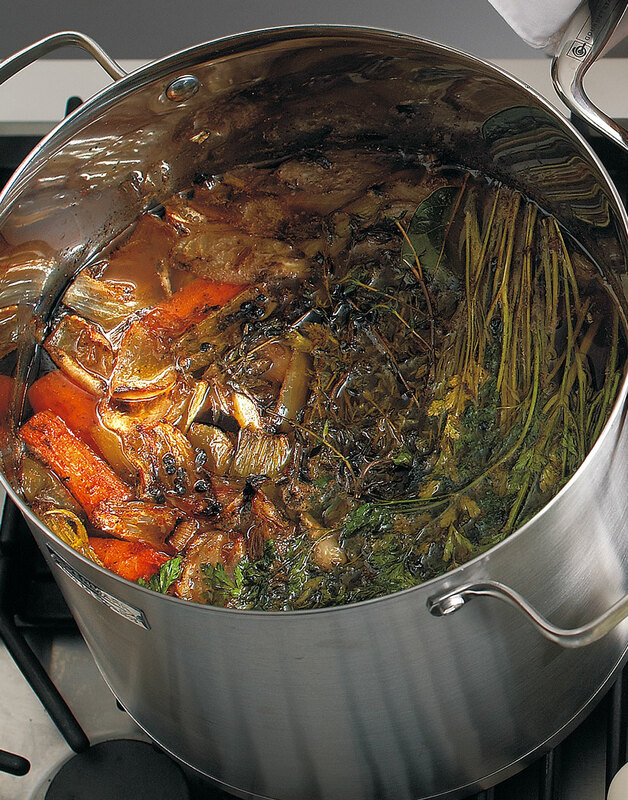 Simmer stock, skimming fat from the surface every 30–45 minutes during the first 2 hours. Simmer stock a total of 5–8 hours, adding more cold water as needed to cover ingredients. Using a fine mesh sieve, strain stock into a large bowl, discarding bones and vegetables. In an ice bath, cool bowl of stock to below 40°. Cover stock with plastic wrap and refrigerate. Before using stock, skim off and discard layer of chilled fat. During roasting, turn the bones every 20 minutes for even caramelization and to prevent burning. Toss the vegetables with tomato paste before roasting to deepen and enrich the flavor of the stock. Deglaze the roasting pan with wine to remove the flavorful brown bits that cling to the bottom of the pan.